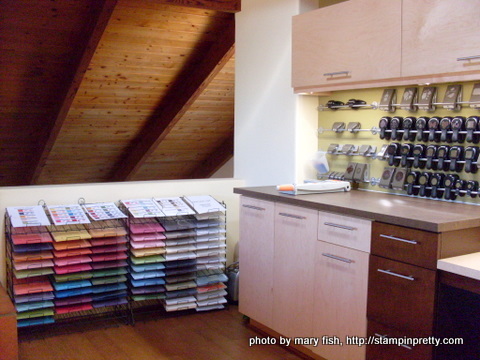 I suppose this is what happens to most spare room when a crafter is in the house. Click here to read the story and see more photos. I love the clean lines and feel of this studio. Very calm and ready to be used, although I know if it was mine it would a mess all the time! And here you have a little video she posted. Ps, for more photos visit her blog here. This is an old tire store sign that my hubs had stored behind his barn. I brought it in and cleaned it up and loved the rustic look so I got a brilliant idea to adhere magnets to the back of some tins. So now I can see all my embellishments. Check more of Crystal's thrifty ideas here on her blog. I am in no way linked to Ikea, except for the fact that I buy 90% of my furniture there because pretty much is the only thing I can afford. But you got to admit this ad is cool and inspiring. A couple of days ago I posted a dinner cabinet refurbishment. 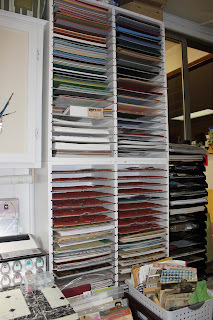 Today, we share this closet recycled into a perfect scrapbooking storage area. 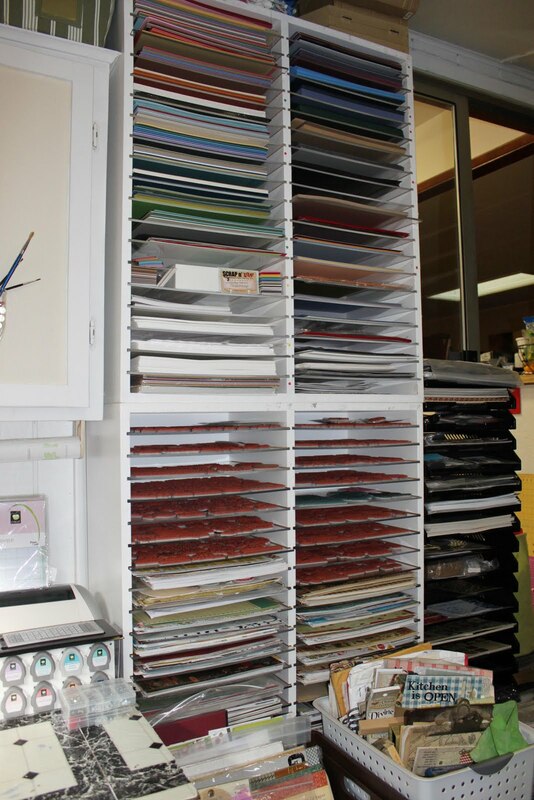 Elizabeth recently removed the closet doors and changed a linen closet into a scrapbook storage area. 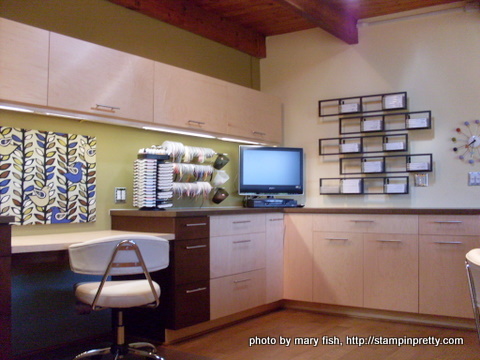 We have had other entries with closets, but it is nice to be reminded of this simple idea, which I think is easy to do as long as you have large closets without any clothes in them. As we requested ideas for shipping stations, we received this entry from 1337 Art. I think is pretty nice. We featured Mary Fish of Stampin' Pretty back in March last year, BUT she has completely revamped her Stampin' Zone in order to gain more counter and storage space, and in doing so she has achieved (in my mind) ultimate organisation! Be sure to visit Mary, she has included some very useful hints and tips on planning your own space. Some of her organisational ideas are amazing! There is also a peek into some of her tucked away spaces as well as a photo journal of the 'The Journey'. Shannon sent me her idea for storing ribbons above, which is very nice and made using just a crate, a few dowels and a little glue gun. 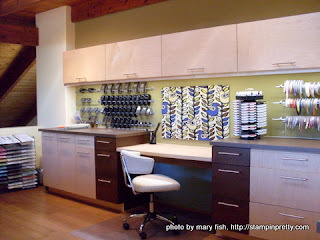 Then I went to her blog, I saw this before and after of a dining room cabinet. Really great to be reminded that we can recycle units and sometimes those are the best and prettiest of storages ideas. Although this idea is not exactly new, it is good to refresh it. This particular one comes from Katy Szwarc. Basically uses one of those trousers hangers that you can open the ends, perfect to fit through the spools of ribbons. here for really good ideas and info. 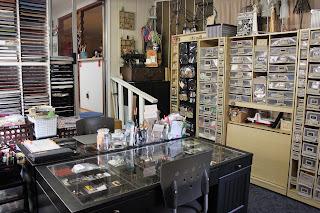 As promised a couple more photos from Candy's space. I love how Candy stores the unmounted rubber stamps. 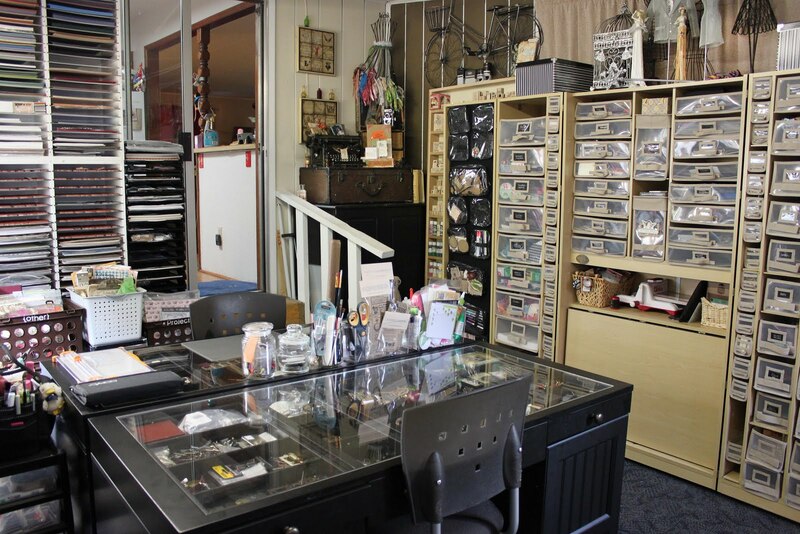 Candy has been recently featured in Creating Keepsakes Creative Spaces and I think you will all agree that her space certainly deserves it. Anyway, here you a glimpse in to it but I strongly recommend to go to her blog here. And in a couple of days I will post another couple of photos that are not on her blog! I wanted a system which I could add onto as my collection grows. 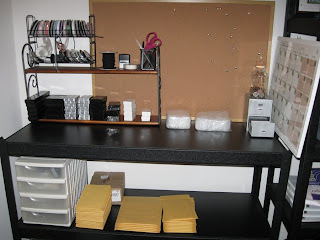 I am on a very tight budget and hate spending money on storage when I could use the money on new crafty bits. I found the perfect answer in foam board. Not only can I taylor make it to my own requirements it is cheap as well.Once I worked out what size I needed I cut out all the foam board with a craft knife, then armed with tacky glue and a packet of pins glued all the pieces together. 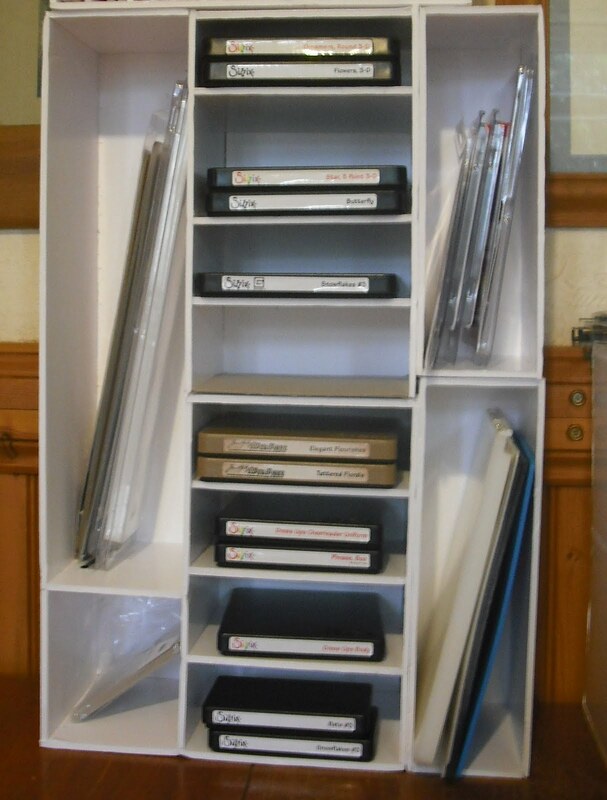 As I stuck to a modular system can have any size shelve I want. 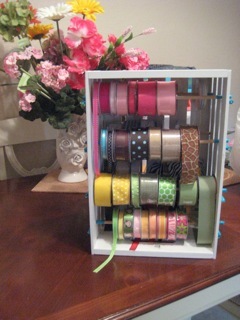 I had enough pieces left to create a solution to how to store my ribbons. Hope you like this ideaSue Moore aka tasker rose.